Summary: The Bible tells of signs that indicate when the end times are coming. Some of those signs have already occurred in history. And there shall be signs in the sun, and in the moon, and in the stars; and upon the earth distress of nations, with perplexity; the sea and the waves roaring; Men's hearts failing them for fear. This passage in Luke refers to the Dark Day of 1780 and the meteor showers of 1833 that ushered in the great Advent movement. After the 1260 years of papal suppression of the truth, New England experienced the famous Dark Day on May 19, 1780, followed by signs in the moon as well. 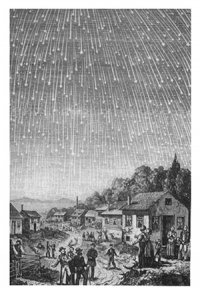 On November 12, 1833, a great meteor shower occurred. Nearly 200,000 meteors fell per hour. These signs were seen across the United States. 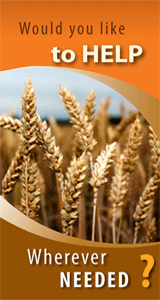 Many believe that these signs are a fulfillment of the Biblical signs of Christ’s Coming. And I beheld when he had opened the sixth seal, and, lo, there was a great earthquake; and the sun became black as sackcloth of hair, and the moon became as blood; And the stars of heaven fell unto the earth, even as a fig tree casteth her untimely figs, when she is shaken of a mighty wind (Revelation 6:12-13). These events fulfilled some of the prophecies that must occur before Christ returns. Even though it seemed like the world was ending on the Dark Day and during the meteor shower, these events do not mean that Christ should have returned in the 1800s or that He will return now. Rather, they were an announcement that the Biblical “time of the end” had begun. This does not diminish the validity of these events as signs of Christ’s soon return. The books of Daniel and Revelation tell us many things that must happen before the Second Coming of Christ. The 1260-year tribulation came to an end in 1798. It was then that God began the final chapter of human history in which we now live. i. "History of Weare, New Hampshire, 1735-1888," (Boston Public Library). ii. The Independent Chronicle (Boston, June 8, 1780): 4, as quoted in W. A. Spicer, "The Dark Day of 1780, Our Day (Review and Herald Publishing, 1918).